Sauder Village, a non-profit historical center near Archbold, features history, education and fun. 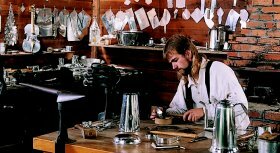 Dozens of 19th century buildings house live demonstrations of the crafts of the time. A campground, a modern country inn, 350 seat restaurant and exhibit halls provide unique experience and hospitality, just 5 minutes from the Ohio Turnpike. Nearby attractions include the Goll Woods, a state nature preserve with the last remnants of the Great Black Swamp, with its wildflowers and 200-400 year old trees. One of Northeast Indiana’s largest annual festivals is the Johnny Appleseed Festival, held on the banks of the St. Joseph River the third weekend of September. The Fort Wayne Children’s Zoo is one of the top 10 zoos for children in the U.S. It hosts 3,000 creatures on 40 acres of beautifully landscaped grounds, including an African Veldt where animals roam free, and an Indonesian rain forest with tropical birds and butterflies. The Children’s Zoo is open late April to mid-October. For more information, call 260.427.6800. And, don’t forget to visit the zoo’s Kidszootube Channel. The Toledo Zoo has a Reciprocal Zoo relationship with the Fort Wayne Children’s Zoo, and offers discount admission to members. The Fort Wayne Children’s Zoo also has a Reciprocal Zoo program with the Toledo Zoo. Imagination Station is Toledo’s science center located on the riverfront in downtown Toledo. Having blended the best of the former science center with dynamic new additions, Imagination Station promises to immerse visitors in a multi-sensory experience that’s as educational as it is fun! Any way you experience it, you’ll have fun! Science Central, is a living laboratory of sights, sounds and hands-on exhibits that help you learn. For scientists of every age who want to learn more about them, there’s plenty to discover here. The History Center Located in downtown Fort Wayne, The History Center is the place for the whole family to explore fascinating artifacts from the city’s past while experiencing hands-on, interactive exhibits. See Anthony Wayne’s camp bed, learn about the great Miami Chief Little Turtle or even do some time in the old county jail!The History Center, also home to the Allen County-Fort Wayne Historical Society, has an extensive archive which includes thousands of documents, photos, and blueprints related to Fort Wayne history. For current exhibit information, special events, or group tour rates call 260.426.2882 or visit www.fwhistorycenter.com.